The savings you make from using VroomVroomVroom to find the best car rental deals doesn't have to stop at the cost of car hire. VroomVroomVroom can put the va va voom into your holiday by giving you the lowdown on the Top 5 Waterholes in the North of New Zealand. This list gives you the insider scoop on the top five must-see swimming spots that are absolutely free. Ringing in at number five is an adrenaline packed ride on a section of our nation's longest river, the mighty Waikato. To say the Taupo Waikato River float is cool would be an understatement, so save this one for a sunny summer's day. Grab an inner tube, boogie board, or polystyrene board and start off on the lake side of the Tongariro Street bridge, heading north out of Taupo, and float on around the bend till Cherry Island inlet. Just get your friends to drop you and your boards at the bridge and park your car hire down at the Cherry Island parking lot for a fun-filled adventure that you will never forget. 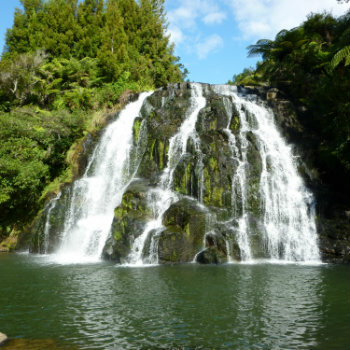 Sitting pretty at number four are the Owharoa Falls in the Karangahake Gorge which are nothing short of breathtaking. Nestled in between Paeroa and Waihi, you will drive through the Karangahake Gorge on a road trip between Auckland and Tauranga. There are wonderful views,and bush walks. The Karangahake Gorge is also part of the Hauraki Rail Trail, so it is possible to ride your bike to the spectacular Owharoa Falls. However, if you are driving, turn right off State Highway 2 into Waitewhata Rd, and park your rental car carefully on the side of the road, near the sign to the Falls Retreat Bistro. It's just a short walk through the bush to the falls and swimming hole. At number three we have a hidden gem that will not disappoint. Maraetotara Falls are around a forty minute drive from Napier, between Havelock North and Waimarama. Take the plunge and dive off the falls into the cool pool below or swing out into the clearing from the rope swing. The Maraetotara Historic Walk goes to the waterfall base. If you have time, continue the walk to discover the old Havelock North power station. Sliding into second place is one of Gisborne's greatest secrets. The Rere rockslide is a natural rock slide located approximately 50 kilometres north-west of Gisborne and has to be the coolest way to spend your day in summer. Be sure to bring your inner tubes and boogie boards. Taking out first place, we have Kerosene creek also known as HotnCold. Naturally heated water, cascading falls, thousands of bubbles, it all just spells out bliss. Drive about thirty kilometres south from Rotorua towards Taupo and turn into the Old Waiotapu Road, which is just after Rainbow Mountain. Follow the road for about two kilometres until you come to a bare carpark. There may be signs there, or not... follow the track into the bush for three to four minutes. Note: While it is fine to park the rental car on the side of the road to go to Kerosene Creek, do be sensible about your valuables. Hide out of sight, or lock into the car boot/ trunk. For the best value deals and easiest car hire bookings, VroomVroomVroom is your first point of call. Just use our simple system to lock in the best car rental rates you can find at one click of a button.